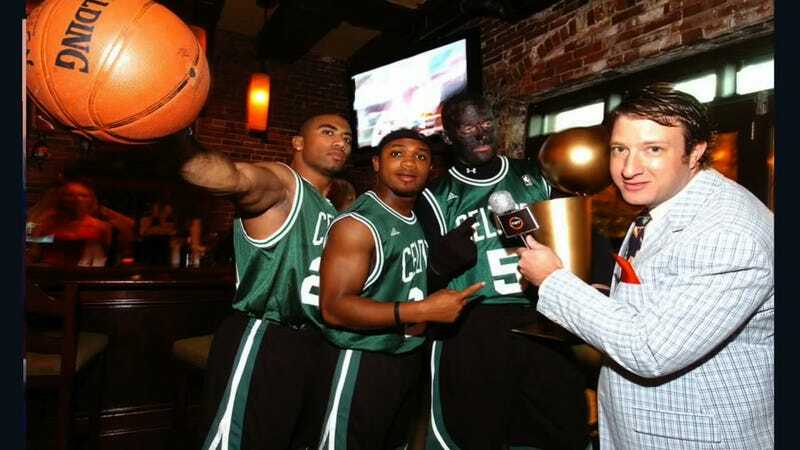 Look, if a white guy and two of his black friends are going to dress up as the Celtics’ Big Three for Halloween, how will anyone know he’s Kevin Garnett—you know, aside from the name on the jersey and general context—unless he puts on blackface? The guy reviving Al Jolson’s routine is Barstool Sports employee Paul Gulczynski, who works in sales at the site. The reason this came up was because he was mad at someone else who works at Barstool over some tweet, and they argued about it, and then people who read Barstool felt invested in the argument because they think they’re friends with people who work at Barstool, so then they brought up the time that Gulczynski dressed up in blackface for Halloween. The usual sequence of events. The site’s acknowledged it in the past: Founder Dave Portnoy brought up the blackface and showed the photos in this video from 2015. The conversation went from Portnoy talking about how he wanted to recreate the rumored Dez Bryant parking lot video—which never did turn up—to a discussion about Gulczynski’s racist Halloween costume. Bloggers Kevin Clancy and Dan Katz offered their thoughts. “If you do blackface with two black guys, and they’re okay with it, you get a pass. You’re allowed to,” Clancy said, on the condition that the two black guys were always present with the person in blackface. The rule of two, as it’s known. And what of the danger of the black guys wandering off somewhere? “You’ve gotta put them on a leash and have them next to you the whole time,” Dan Katz said a little later. Good idea. Former NFL lineman Willie Colon, who hosts a radio show for Barstool, wasn’t happy when someone showed the photo to him on Monday, but he said the next day that he smoothed it out in a chat with Gulczynski. That must’ve been illuminating. I asked Gulczynski for more info about the stuff on his face, but he hasn’t replied. This choice was regrettabllleeee!